I own a Laptop and a PC for working in all conditions. Recently, I updated my Windows 7 and applied a security update. After this the Chrome browser started crashing. This was a great turn down and I lost some important hours of work on it. I searched on internet for how to resolve Chrome crashing issue. I found a tutorial on Google to solve the general “Whoa! Google Chrome has crashed” issue but it did not worked. I tried few other tutorial but nothing worked. But lastly I found the resolution on a forum, the fix was rather easy and simple. I have fully researched on the issue and most of the issue is due to a plugin or some other system file. We have tried to put some most working solution together. Java may get unfunctional some time, this is the reason it has lost its reputation in the last couple of months. You must be aware of the fact that it is Java which powers 3 billion devices across several platforms. If you want to remove Java from your Windows Pc/ Laptop, go to the “Control Panel > Programs and Features / Uninstall a program” and uninstall from your system. Now, to remove it from your browser, type in the address bar “chrome://plugins/”, here locate Java and click on “Disable”. Flash comes pre-built with chrome, so often on people face issues with it (so you should not essentially install it from adobe’s website). Internet Download Manager (IDM) – This issue is caused by outdated versions of Internet Download Manager. If you are running IDM 6.02 or earlier, you may experience crashes in the Google Chrome web browser. To resolve, update the program to the latest version (at the time of writing that is 6.12). You can alternatively disable advanced browser integration under Options > General in IDM. Asus EeePC print crash – Asus EeePC owners that have Asus WebStorage installed my experience print crashes in Chrome. This too is caused by an outdated program version which you can resolve by updating Web Storage to the latest version. Stopzilla (iS3 Anti-Spyware) may cause Chrome to crash. Google suggests to update the program to the latest version to see if it resolves the issue. If not, disabling or uninstalling is an option. ESET Nod32 Antivirus – Earlier versions of the antivirus software are incompatible. 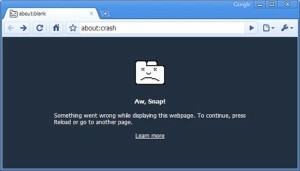 If you are running version 2.7 or earlier you may notice crashes in Chrome. Solution: update to the latest version or disable Internet monitoring. The performance optimization and monitoring application NVIDIA nTune is incompatible with Google Chrome. Temporarily disabling may resolve the issue. NVIDIA Desktop Explorer is also incompatible with Google Chrome. This is caused by the nvshell.dll which you may want to remove from the system. Alternatively, disable or uninstall the desktop manager. Hide My IP may cause crashes in Google Chrome. Disable for the time being or check for updates to see if it resolves the crash issues. WinMount, a program to compress and decompress archives and to mount archives on the system, appears to be incompatible with Chrome. You may try and update the software, or if that does not work, disable it instead. Venturi Firewall can crash Chrome as well. Try updating the desktop firewall to see if it resolves the issue. If not, disabling or uninstalling may be the only option if you want to continue using Chrome. PPLive, a live video streaming software, may cause Chrome to hang or crash. To resolve, update to the latest version. If issues remain, disable the integration in Chrome. Profile corruption. If Chrome crashes seconds after opening, or get “Aw Snao” error messages all the time, your profile may be corrupt. Follow the instruction posted here to create a new default profile to see if it resolves the issue. Other software that may crash Google Chrome: Safe Eyes Parental Control Software, ContentWatch, Microsoft Office XP Input Method Editor,Naomi Web Filter,Trusteer Rapport. Try updating first, if that does not help, disable or uninstall. If you sync your data to your Gmail account or if you want to bookmark a lot of web pages, you may face this problem- every time you open Chrome you are welcomed with this error. To fix it, open “Run” (Windows Key + r) and paste this location on the dialogue box “%LOCALAPPDATA%GoogleChromeUser Data”. Here rename the “Default” folder to something else and then try opening Google Chrome. You can also use any system cleaning app such as: CCleaner, also check under the Application tab, check all the options in Chrome section, and run the cleaner. Google Chrome has been built with various plug-ins and scripts, therefore all entries will work around with each other. Moreover, installing new software that integrates itself with Chrome can also be one of the reasons behind a crash. To verify the reason, type “chrome://conflicts” in your address bar. Now, check if Chrome is suggesting any present mess or not. If so, than you should remove such stuffs from Chrome. Just remove the redundant plug-ins from Chrome, this way you can resolve such errors/ crashes and also can speed-up your browser. Important: While installing a software, ensure that you uncheck the “Yes, install this toolbar” option. If all the above tricks does not work in resolving the error you are facing don’t be upset. You can upgrade your browser, if it does not resolve the error, uninstall the browser without keeping any preference file. Also, you can run system and registry cleaner (CCleaner). You should download and install a stable and not the beta version of Google Chrome, reboot and then install the same on your PC. Many of the times Firefox get crashed or hangs because of unresponsive scripts. These problems generally occur when you are using a secured web location. To fix this problem, just type in “about:config” in the address bar. Then, click on the “I’ll be careful, I promise” message box that appears. Next, search for “dom.max_script_run_time” and change its value from 10 to 20. If you have updated your Firefox recently and have used Silverlight software, Microsoft alternative for flashing you may have faced this problem. To resolve this problem, remove and re-install Silverlight. If you cannot do it, then open run command or you can type “services.msc” (for Windows 7 or Windows 8). Then, search “Tablet PC Input Service”, right-click on the same and then select “Stop”. If still you are unable to stop the service, then use CCleaner and run registry clean. Any of the plug-ins can also be the reason for crash, to remove the particular plug-in, open Firefox and then press “Ctrl + Shift + a” (you can also open Addons from file menu), then select the plug-ins section and disable the third party plug-in which is causing the problem. If still you are facing problem then try opening Firefox in safe mode (press shift key while opening it) and then click on “Start in safe mode”. If this trick works, remove any recently installed add-ons. You should essentially disable Java from there.